A 2014 article on the internalisation of Cochlear Implants drifted across my FB feed this week. In it, the author (Patrick Dehahn, who describes himself as a ‘person with hearing loss’) questions whether technological advances like invisible hearing aids might threaten both deaf and Deaf (if we’re still using the two?) identities. To be honest, I think the article’s a shocker… Dehahn seems to sit somewhere between deaf and Deaf, and signs a bit, and speaks, and mixes up references to ‘deaf’ and ‘Deaf’ community, and relies on American social distinctions in a way that’s not very helpful… but what he wrote did stir something in me, because I think it’s the first time that I’ve noticed someone arguing that they needed to ‘appear’ deaf in a hearing space, in order to secure their identity for hearing people. And that reference to a spatial anchor for identity (particularly based on some of the other stuff that he goes on to say) is thought-provoking. In essence, what Dehahn says is that, as hearing-aid technologies become less visible, it will be harder for deaf people to ‘appear’ deaf to hearing people, and so people won’t believe them. And nor will, he suggests, other deaf people, or even culturally ‘Deaf’ people – who won’t know whether they are deaf, or hearing, or what! That aside, that notion that his identity as a deaf person is anchored, not in deaf spaces, but in how hearing people ‘receive’ him into their space, is powerful and, with all the focus on Deaf space in my work, not something that I’ve thought about a great deal. That you could ‘fail to qualify’ in the hearing world as a deaf person, if you don’t ‘act’ deaf. It’s an easy definitional juke to make. Kind of like making previously disabled people suddenly able-bodied, by changing the parameters of how disability is measured. And those who suffer most are those who rely most on the hearing world for inclusion. Like Dehahn. … and isn’t that the interesting point. That Dehahn sees this as a problem because he IS reliant upon hearing people to validate his marginal identity all the time. … and isn’t it interesting that that’s exactly why I don’t think Deaf people will have the same problem, because their referential anchor (in identity at least) is somewhere else, in Deaf space. 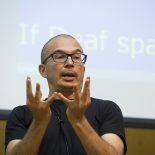 But it is interesting, and I’ve not spent much time on the question of how deaf people are ‘received’ in hearing spaces, and what encodes a deaf person in the expectations of hearing spaces… and how deaf people who fail to fit the mould succeed in overturning them. So I should do that more. And in the meantime, perhaps Dehahn should get a tattoo. (This picture, by the way, is a whole other story, which would need more space to unpack, but which makes my father’s heart sing, and all my other hearts grieve together at a society where a small child can’t be complete with signs on her hands, but needs tech in her head). I always really enjoy reading your posts. You do cause me to think a lot about deafness/Deafness and about how they are perceived as a community vs. how they perceive themselves. Thanks Laurie – the Deaf community in the US and the UK, in fact internationally, is changing rapidly too… some bits staying the same, some evolving… so in many ways, it’s a constant journey to keep up! If you really want a good watch on this subject, and have an hour, then have a look at https://www.youtube.com/watch?v=h7nnA7B4T04. This was on UK TV recently, and is a uniquely real view into UK Deaf culture. This entry was posted on August 3, 2016 by Mike Gulliver in Musings.